Air pumps for the aquarium are different than water pumps and are a valuable addition to any aquarium. They help to oxygenate the water and can work to reduce the workload of the filter. The air pump is not a mandatory piece of equipment for your tank, but it is an appreciated add-on that will certainly help keep your water healthy and benefit your fish. Let’s take a look at a few air pumps that are on the market today. 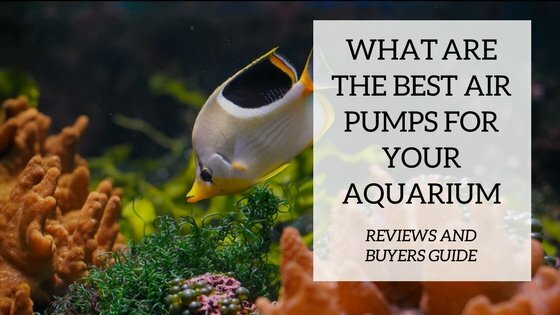 We will review the 5 best aquarium air pumps in order for you to make an informed decision regarding the purchase the best aquarium air pump for your needs. The aPump Air pump is an all in one air pump that functions on the Piezoceramic Technology. This air pump is very quiet, small, and quite powerful. This brand has two different models, one has a single outlet and another that has two. As the other all in ones, this is easy to install and get going. This powerful air pump can be used in the tanks that are up to 60 gallons. Tetra brand is a well-known and trusted company to buy air pumps from. The Whisper Air Pump comes in different ranges for a variety of aquarium gallon capacities, from 10 gallons to 100 gallons. This dome shaped designed air pump flattens the vibrations ensuring a quiet function. This pump needs to be supplemented with tubing and whichever device you choose to put in your aquarium to distribute the bubbles. It can even be synced to sponge filters. This pump is very powerful and delivers maximum air flow to the water. Again, Tetra is a leading brand in air pumps on the market today so you know you are getting a quality product. The Whisper Air Pump for Deep Water AP150 is one of the most powerful pumps for domestic use on the market today. It is, as its name suggests, suitable for deep water tanks. This means that it can provide enough power to send air on long conduits. This air pump is designed for the larger tanks and it comes in 2 different options, for aquariums up to 150 gallons and another model for tanks up to 300 gallons. This pump can be used for multiple devices. Having all that power also means that it is a little noisier then other pumps. This is a compact and quiet model that can be used in aquariums up to 40 gallons. It is an all in one product so it comes with tubing and air stone attached. It is space saving compared to the bigger air pumps. It uses a different principle then the vibrations of traditional air pumps. The Piezoelectric ceramic plate is what makes this pump function. It’s also easy to install and maintain. It is known to be very energy efficient and long lasting. The Active Aqua Air Pump comes in different models providing a variety of outlets offering several options for air supply. From one outlet device to the one with eight outlets. This is a very powerful air pump that claims to be energy efficient. Air pumps circulate air and keep it moving in the aquarium to provide extra freshness to the water. 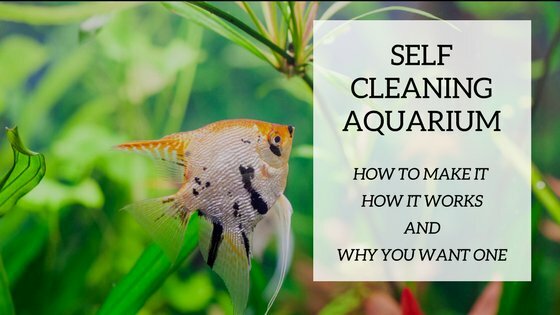 Stagnating and idle water can create big problems in an aquarium, like unsightly algae growth and even fish loss. Air pumps are made to oxygenate the water in the tank and keep it from stagnating. The air pump works by operating on an electromagnetic system that vibrates at a rapid speed through a rubber diaphragm that in turns causes vibrations in the water. Newer technology now offers smaller pumps that function without vibration on ceramic plates. The air passes through a tube that delivers it to a stone, a sponge, or an ornament placed inside the tank. The bubbles are not the actual suppliers of oxygen, but the movement that is caused at the surface of the water is. The more the surface water moves, the more water is in contact with the exterior air and therefore providing more oxygen into the tank water. Obviously we all want healthy and clear water in our tanks. It is essential to look at all possible avenues to achieve this. Adding an air pump will most certainly help with water quality. Freshwater tanks especially benefit from this added oxygenation. This youtuber explains why he installed an air pump and his fish are reaping the benefits. The added bubbles that are formed are also an added visual element that is quite pleasing in an aquarium. Some people really enjoy that extra element of movement in the water. This is by far the most talked about factor when shopping for an air pump. Being that they function through vibration, they have been known to make a ruckus and thus considered to be an unpleasant addition to tanks. Nowadays, air pumps are providing quiet functionality without depleting quality. You need to keep the system clean in order to avoid noise. Most complaints come from customers who have let the air pump stone get dirty and thus making it work harder which in turn makes the system louder. When shopping for your air pump it is imperative that you choose one that is appropriate for your tank size. 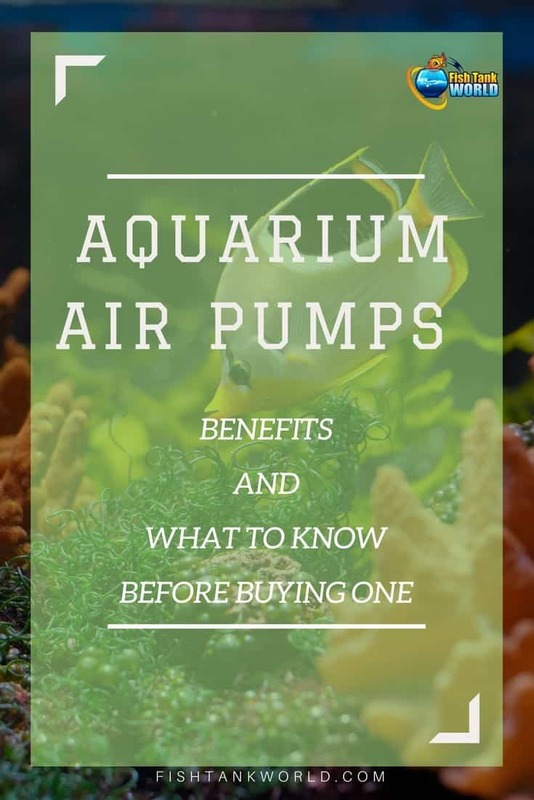 If you purchase an air pump that is too small for the amount of gallons your aquarium holds, it will be working overtime and thus making more noise than necessary. Like most other tank accessories that you have bought or will buy, always check on the box the recommended gallons usage. There are several different types of air pumps on the market. Some consist of the pump only, where the silicone tubing and air stones have to be bought separately. Some may be attached to decorations that are air driven or even sponges. Other devices come ready to install including the tubing and the air stone. The latter tend to be for the smaller and single tanks. The pumps for the larger aquariums sometimes come with more than one outlet for tubing, meaning that one single pump can be used for more than one aquarium. Air pumps will not break your bank. This an affordable addition to your aquarium. They range in prices depending on the brand and functions, but overall they are quite accessible. Depending on the size of your tank, you will have to choose if you want an all-in-one air pump or purchase your elements separately. Make sure to have all the information you need while purchasing the external elements for your air pump. 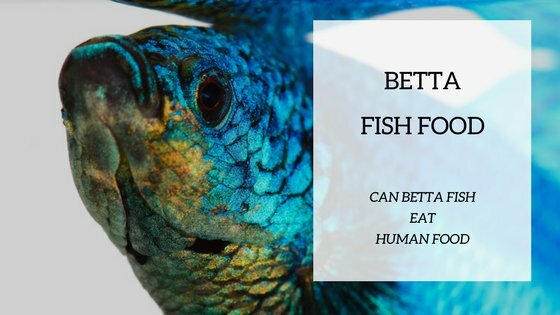 A knowledgeable sales person can surely help you at the pet or fish store should you have any concerns. Look at the warranty of the product you wish to purchase and the reputation of the producer. Also, read some comments on the costumer service quality. This is a highly debated topic and ultimately it is a personal choice. 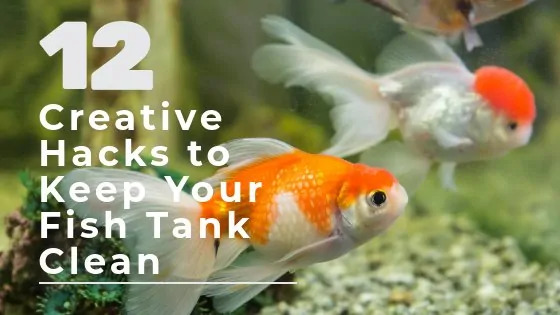 It is up to you to know if you want some added options to providing healthy water for your fish and if you enjoy the look of having bubbles in your tank. It is a piece of equipment you can live without, however an air pump definitely brings benefits. Watch this video where he also explains the benefits of having an air pump, especially in freshwater tanks. Like we said, installing an air pump is not essential, but definitely an added accessory that will assure clear and healthy water. It will most certainly not harm your aquarium nor your fish. We enjoy the bubbles that are provided that give an added interest to any tank. Our tip pick air pump is the aPump Plus Air Pump.It is extremely quiet and provides the best value for the money. It is versatile with the two outlet option and provides new technology that makes it energy efficient as well. It is compact and super easy to install. Any one of these air pumps will provide lasting and powerful oxygenation to your aquarium. Choose the best one that suits your needs and also appropriate for the size of your tank.